The Gatzke translation of Clausewitz's Principles of War is displayed on The Clausewitz Homepage with the permission of Stackpole Books. Reprint and other copyright permissions must be obtained from Stackpole. The Clausewitz Homepage's HTML version is copyright Clausewitz.com but has been illegally confiscated by Google Books. If you need a PDF version, use the authorized version. 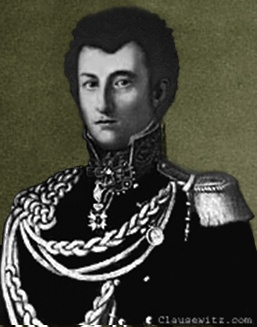 For background on Clausewitz, visit our FAQs page. We also have the older translation of this work, the 1873 translation by Colonel James John Graham, originally published as an appendix to Graham's translation of Carl von Clausewitz, On War (London: N. Trübner, 1873), in German Vom Kriege (Berlin: Dümmlers Verlag, 1832). 9. Another method of using these obstacles to protect our front is to leave them a short distance ahead. They are thus within the effective range of our cannon (1000 to 2000 paces) and we can attack the enemy's columns from all sides, as they emerge. (Something like this was done by Duke Ferdinand at Minden.4 In this way the obstacle contributes to our plan of active defense, and this active defense, of which we spoke earlier, will be executed on our front. Article: "John Keegan and the Grand Tradition of Trashing Clausewitz"
Article: "Tiptoe Through the Trinity"
Article: "Clausewitz, Nonlinearity and the Unpredictability of War"